Editor's note: This story has been updated to reflect a comment from the FEC vice-chair. Washington (CNN) -- Republicans and outside groups used anonymous Twitter accounts to share internal polling data ahead of the midterm elections, CNN has learned, a practice that raises questions about whether they violated campaign finance laws that prohibit coordination. The law says that outside groups, such as super PACs and non-profits, can spend freely on political causes as long as they don't coordinate their plans with campaigns. Sharing costly internal polls in private, for instance, could signal to the campaign committees where to focus precious time and resources. The groups behind the operation had a sense of humor about what they were doing. One Twitter account was named after Bruno Gianelli, a fictional character in The West Wing who pressed his colleagues to use ethically questionable "soft money" to fund campaigns. Posting the information on Twitter, which is technically public, could provide a convenient loophole to the law — or could run afoul of it. "It's a line that has not been defined. This is really on the cutting edge," said Paul S. Ryan, senior counsel at the Campaign Legal Center, a nonpartisan organization focused on campaign finance issues. "It might not be legal. It's a cutting edge practice that, to my knowledge, the Federal Election Commission has never before addressed to explicitly determine its legality or permissibility." The accounts that CNN reviewed were active in the months ahead of this month's election, which gave Republicans their largest majority in the House since World War II and control of the Senate. They were live until Nov. 3 but deleted minutes after CNN contacted the NRCC with questions. Representatives for American Crossroads, American Action Network and the NRCC declined repeated requests for comment for this story. CNN captured screenshots of the Twitter communications before contacting the parties involved. American Crossroads dropped $21.6 million during the most recent election cycle, according to the Center for Responsive Politics. The American Action Network, meanwhile, spent nearly $9 million on federal elections in 2014. It's difficult to determine whether Twitter posts prompted ad buys or other spending in specific races. 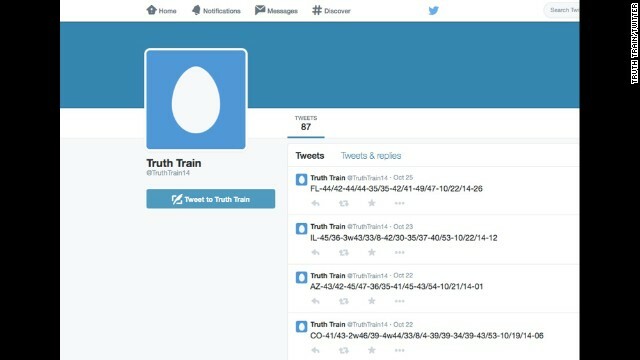 Two of the profiles were named @TruthTrain14 and @brunogianelli44 but it's unclear which group used specific accounts. Still, the tweeting through special code could raise questions about whether the groups illegally coordinated, according to Kenneth Gross, a former head of the FEC enforcement division who now advises Democrats and Republicans on campaign finance issues. "If it truly requires some sort of Ovaltine decoder ring to make heads or tails of the information, then there certainly is the possibility that there was some pre-arrangement," Gross said. "Just making it public is not enough. You have to further meet the requirement of no pre-arrangement or coordination. But it is the burden of the government to demonstrate that." The tweets captured by screenshots stretched back to July, but the groups have communicated in this manner for four years, the source said. Staffers for each group deleted individual tweets every few months, so only the past few months of data were available when CNN first viewed the Twitter accounts. The social media strategy isn't the first time parties and outside groups have used Twitter to communicate. In April, it was Republicans who accused Democrats of attempting to "subvert campaign finance laws" when the Democratic Senatorial Campaign Committee's official Twitter accounts posted messages that Democratic super PACs later incorporated into their ads. And both parties are working hard to find ways to work more closely with well-financed outside groups. Earlier this year, for instance, the National Journal reported that Sen. Jeanne Shaheen, a New Hampshire Democrat, posted what appear to be ad scripts on her websites that Republicans say telegraphed messages the campaign would like to see on the air. In the North Carolina Senate race this year, Republican Thom Tillis' campaign posted a detailed memo on its website specifically laying out its needs for television and digital ad buys. Meanwhile, outside groups also share details of their plans by releasing spending plans to the media or posting the information on their websites as press releases. But the Twitter accounts in this case are unique in that they did not publicly identify their association with the groups who posted to them or advertise their existence. The strategy, Ravel wrote on Twitter, "shows that tech changing politics... but coordination rules sadly murky." The practice also serves as another reminder of Washington's revolving door between campaign committees, party leadership and outside groups. The spokesman for American Crossroads, Paul Lindsay, and the president of American Action Network, Brian Walsh, both formerly worked at the NRCC though there's no evidence that they were involved in the Twitter posts. Despite the questionable nature of the Twitter communications, experts doubt the FEC will do much to act. Members of the commission have been deadlocked along party lines for years and attorneys for these groups often develop legal arguments before engaging in such practices to avoid acting outside the bounds of the law, Ryan said. "In many instances, we have very sophisticated political players with really good lawyers who know where the legal lines are and know where to push them to their client's advantage," he said.